Theodore Adorno’s use of the term “barbarism” has probably been most often referred to in the context of his much-cited dictum that “to write poetry after Auschwitz is barbaric.” While, nowadays, the term is usually and fortunately presented within the broader context of his works, his intended meaning was frequently misunderstood particularly after Adorno had articulated it for the first time. For clarity, the aforementioned dictum was not a verdict intended to silence poets or artists. It was rearticulated a few times by Adorno—specifically in response to Celan’s poetry—who calls for arts and culture to respond from within and in the face of an inescapable aporetic condition. Namely, to write poetry after Auschwitz means to write from within a differend—a radical chasm between the signifier and the signified that one neither ought nor could overcome via writing or aesthetic means in general. Yet, poetry (and also art and thinking, per se) as a form of active engagement with sociopolitical realities, has to respond to the ungraspable (i.e., the Holocaust); it cannot simply avoid doing so. It permanently has to speak whilst knowing that it will never reach the addressee; that it must fail in speaking. While much controversy prevailed over the dictum as a whole, little attention has been devoted to the term “barbarism” implied therein. However, understanding the concept in the broader dimensions underpinning Adorno’s (and partly, Horkheimer’s) usage of it is crucial for fully grasping the dictum. Most importantly, the miscellaneousness of “barbarism” touches upon a myriad of issues characteristic of Adorno’s overall theoretical venture. Namely, the term reoccurs in the context of his critiques of technical rationality, of mass culture, and of progress. In short, in his radical critique of the Enlightenment as adhering to an exclusionary form of instrumental reason. “Barbarism,” while never explicitly defined by Adorno, can thus be considered to, at the very least, implicitly address the complexity of his critical philosophy as a whole. The term appears not only in “Kulturkritik und Gesellschaft,” where it was articulated in relation to the aforementioned dictum, but also in most of his major works, Negative Dialectics, Minima Moralia, The Dialectic of Enlightenment and, in what many consider to be his (posthumous) magnum opus, Aesthetic Theory. I contend that there are four diverging yet intertwined dimensions that underpin Adorno’s usage of the term, all of which primarily reflect his radical and permanently present call to face infinite ethico-political responsibility in the face of an irreversible past. This call concerns not only the arts or culture alone, but also involves science and politics — the society as a whole conceived of as a center that relentlessly excludes peripheries. In essence, it concerns our very own engagement with socio-political realities. The first and probably most obvious dimension is related to the Holocaust as the utmost expression of barbarism. Connected to this dimension is a fundamental aporetic condition, that is, we live on in spite of Auschwitz, which, as the “ultimate end”, would logically prohibit any sort of living on in its aftermath. A certain barbarism is thus, per se, implied in our very being in an era post-Auschwitz. Any single word is a confirmation that life can go on after; any articulation of a concept or term relentlessly affirms what would have to be radically negated, but what can no longer be negated as the negation is no longer available to us. The past cannot be reversed. To put it bluntly, a consequence of this is that the whole (i.e., being) itself is barbaric; this implies that “nothing less than all things are barbaric” – another facet of the dictum “to write poetry after Auschwitz is barbaric.” In one very general sense, it is barbaric simply because anything one could think of is barbaric; thinking itself is barbaric as it is a mode of continuous existence. Thus everything is barbaric: to write, to breath, to live—specifically, to live-on. Auschwitz irrefutably demonstrated the failure of culture. That it could happen in the midst of all the traditions of philosophy, art and the enlightening sciences, says more than merely that these, the Spirit, was not capable of seizing and changing human beings. […] Whoever pleads for the preservation of a radically culpable and shabby culture turns into its accomplice, while those who renounce culture altogether immediately promote the barbarism, which culture reveals itself to be. As I mentioned earlier, in spite of frequently alluding to a barbaric whole (in both a general sense and in relation to culture as a specific mode of living-on) Adorno is not attempting to silence culture, arts or philosophy. What he termed a “New Categorical Imperative” attests much to this. The articulation of this imperative in his Negative Dialectics can best be seen as his own response to the more general barbaric condition expanded upon in (I) and (II). Imposed upon “unfree mankind” by Hitler, this imperative demands that individuals “arrange their thoughts and actions so that Auschwitz will not repeat itself, so that nothing similar will happen.” Initially striking is Adorno’s assumption—much expanded upon with Horkheimer in the Dialectic of Enlightenment—that men are “unfree”, meaning that they are far from having successfully released themselves from self-incurred tutelage. Auschwitz had finally proven that the alleged linear process of “civilization” had not suspended barbarism—far from it. Its relentless and irrational suppression has not served to overcome it; rather its ignorance reinforced its return in the form of utmost excess with the result of turning an envisioned universally enlightened end-state into a radical disaster eliminating any possible allusion to universality as such. Consequently, Horkheimer and Adorno attest that we can no longer hope for salvation in simply appealing to alleged universal reason (the Kantian Vernunft). No means exist in which men could ever be freed (not to mention a means in which they could free themselves) from the general, intrinsically barbaric condition in the first general sense mentioned. However, rather than reclaiming a hopelessly lost universality, our responsibility in light of the new categorical imperative is first and foremost to confront ourselves with our own irreparable failure. In spite of this, it is crucial to acknowledge that Adorno hints at potential unbarbaric modes of responses to the fundamentally barbaric general condition mentioned, and it is these that we ought to concentrate on as well as respond to; the New Categorical Imperative which so emphatically calls not solely on our thoughts but also, and particularly, on our actions that goes along with the demand to “restore an unbarbaric condition.” Thus, in spite of the whole being barbaric, the “sole adequate praxis after Auschwitz is to put all energies toward working our way out of barbarism.” Practically, this must, of course, remain utopian in light of the whole being inevitably barbaric; however, there is a sense in which we could at least work toward a threshold pointing toward this impossible utopian restoration. Adorno envisions a condition for which there is no locus, which is why it is utopian in the very literal sense of the term’s origin. There is merely a nonplace, a u-topos for it. In this sense, it guides our actions and thoughts via calling on our responsibility from within an aporetic condition. Our responsibility—in spite of the whole being barbaric—is then, finally, to decode those peculiar barbaric impetuses that prevail within what Adorno and Horkheimer refer to as “new barbarism.” These occur in the context of cultural-political modes of being that are more specific than the general “barbaric condition” in which we adhere (in the sense that we have decided to live on after the ultimate end). Adorno’s implicit call to respond to specific barbaric impetuses that still constitute the sociopolitical has consequences regarding our modes of reasoning on the one hand (a thought that dominates much of his Negative Dialectics and his Einführung in die Dialektik) and the ways in which we relate and respond to processes of reification on the other (most explicitly articulated in The Dialectic of Enlightenment and in his writings and commentaries on the culture industry). Adorno contends reasoning always risks becoming totalitarian. It always involves the judging, naming and conceptualizing of some other. Any concept, too, risks losing peculiar heterogeneities and potential ambiguities that adhere to the object. By way of example, the term “society” (or, Gesellschaft in German) attempts to subsume an extremely ambivalent and ever-changing actuality into an allegedly coherent concept. In other words, there is always a considerable and unavoidable amount of violence exerted in the processual course of conceptualization (Begriffsbildung), which cannot but abstract from and thereby reduce the objects it perceives. (In the Einführung in die Dialektik, a series of lectures held at the University of Frankfurt am Main, Germany, in 1958, Adorno frequently uses the expression “does violence to the Object” [“dem Gegenstand Gewalt antun”]). The thinking and reasoning subject that loses awareness of this fundamental epistemological aporia becomes inevitably hegemonic, dogmatic and, therefore, totalitarian in the sense of promulgating a mode of reasoning that subscribes to two extremely problematic modes of irresponsible abstractionism: (A) a positivistic, scientific, quantifying mode of thinking, as well as (B) a bureaucratic, disengaged, unworldly way of being and acting. To the contrary, an unbarbaric mode of thinking refrains from deductions; it does not seek security in fundamental “firsts” or absolutes in the sense of a prima philosophia. One passage articulated in his Einführung in die Dialektik sums this up nicely: The relation between the universal and the particular, Adorno asserts here, is something “over which the thinking being properly has no power” (“worüber der Denkende eigentlich keine Macht hat,” and to pertain to this powerlessness toward the object is—strikingly—a “criterion of truth.” Any consolidating synthesis reconciling that over which I am in truth powerless would thus by necessity imply a considerable amount of force. To put it in Adorno’s terms, a synthesis would be “applied” to the object by the “arbitrariness of ordering thought” (“von der Willkür des ordnenden Denkens […] aufgeprägt”). To avoid this quasi-hegemonic stance implied in “ordering thought”, Adorno subscribes to a very idiosyncratic perspectivism—one that is always attentive and capable of responding to the unexpected, whilst remaining aware of the need for concepts—even if Adorno, at points, seems to be calling for an almost rhizomatic mode of thought. While Adorno frequently alludes to “labyrinthine paths” and even speaks of “subtarranean corridors” and “inter-related models,” he still, strikingly, adheres to the picture of paths. What he hints at could thus probably best be imagined as akin to Paul Klee’s illustrated quasi-labyrinth in Haupt- und Nebenwege (1929), where a major path is still graspable which allows for a myriad of minor paths ending in uncertain horizons. This arguably separates Adorno from Deleuze’s rhizome. Adorno does not go so far as to call for thinking without concepts; for him, there is no such thing as an image- or concept-less thought, and neither should there be one in spite of the radical chasm between object and subject. In essence, what Adorno hints at in the very last consequence is a thinking that applies the critical force of reason onto itself as a reflection on an Enlightenment tradition that has lost its own consciousness, having thereby become, to a certain extent, alienated from itself. The last dimension within which a “new barbarism” becomes most clearly evident is in the context of Adorno’s rejection of the new rise of capitalism’s massive culture industry that he closely witnessed in the late 1930s and 40s during his exile in the US. During this period, barbarism reoccurred in the hegemonic modes of fabrication of goods, of massification of cultural objects. The ever-expanding market as a constantly growing field that so quickly entered the sociopolitical could only reveal an implicit complicity with barbarism in that it was entrenched in an ideology related to a system trying to control a mass. It promoted a form of culture that prioritized sameness over critique and thoughtless enjoyment over an urgently needed, committed confrontation with actualities. None of what Adorno saw emerging in capitalist culture was, to his account, in any way responsive to the ultimate peak of barbarism itself (i.e., the Holocaust as the ultimately destructive Ereignis), and, in this way, was non-responsive to his newly formulated imperative. He saw too little (if any) theoretical and practical preoccupation with culture’s own complicity in light of Auschwitz, specifically after WWII. To the contrary, capitalism’s relentless production of sameness (what Adorno frequently termed the “Always-the-same”) inevitably contributed to total homogeneity which excluded otherness and, with it, non-identicality. The Culture Industry again formed a mass in spite of its emphatic propagations of liberty on the grounds of an alleged emancipation of the general, as discussed above. If the nineteenth-century connoisseur only stayed for one act of an opera, partly for the barbaric reason that he would allow no spectacle to shorten his dinner, barbarism has now reached a point, the possibility of escape to a dinner being cut off, where it cannot stuff itself full enough of culture. Every program must be sat through to the end, every best-seller read, every film seen in its first flush in the top Odeon. The abundance of commodities indiscriminately consumed is becoming calamitous. It makes it impossible to find one’s way, and just as in a gigantic department store one looks out for a guide, the population wedged between wares await their leader. However, also in the context of capitalism’s barbarism—a theme so dominant in Adorno’s writings—one can find margins expressing a glimmer of hope for potential escape routes. Adorno, at points, calls for what he terms “barbaric asceticism…towards progress in technical means” and “mass culture.” This glaring statement is vital regarding the contemporary cultural-political situation. How such “asceticism” might appear is hardly envisionable nowadays, which makes Adorno’s writings and a thorough reflection on his concept of barbarism with a focus on its sociopolitical connotations all the more pressing. Anna-​Verena Notthoff is at Johann Wolfgang Goethe Universität, Frankfurt, Germany. 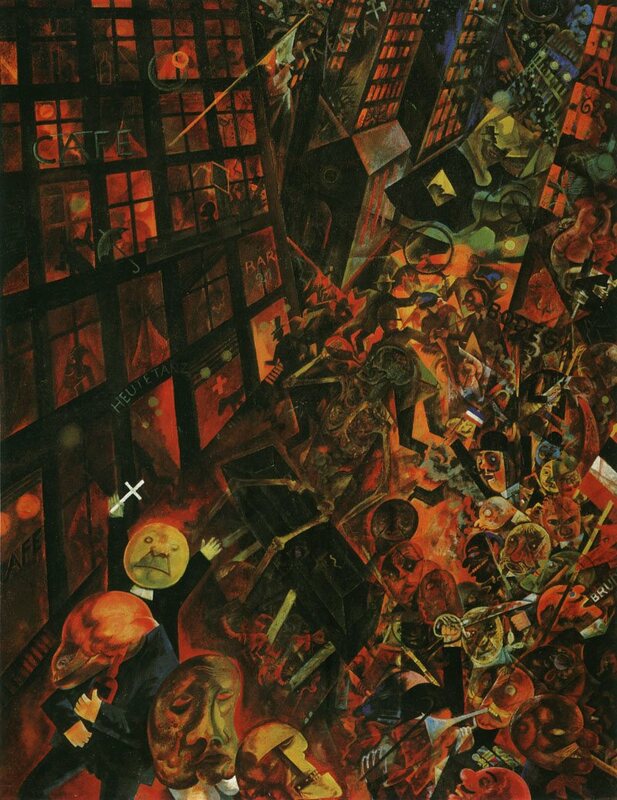 The photo shows, “To Oskar Panizza,” or “The Funeral,” by George Grosz, painted 1917-1918.